What breed do you think my dog may be? About a year ago I sent in a picture, but she was much younger. So I wanted to see if anyone has any other opinions. Thank you all for your input. She really looks like a pit bull. Is that the feedback that you received? She's beautiful! Looks like a Pit to me too! A cutie! Looks like a pit bull or part pit bull, that's for sure. The breed is beautiful, family, precious, loving and all the good things. Her expression is phenomenal . Bet she is absolute devotion. My 2 cents, 100% Pit bull. A big percentage of your dog looks like pit bull, by the way, he is quite handsome. She definitely looks like a pit bull. She is a very beautiful dog. 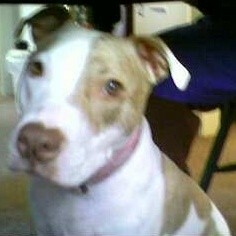 Well it seems like everyone agrees that she is either 100% Pit or mostly pit bull. Thank you all. She is very sweet and we love her very much. She is our little angel.